Despite Israel's posing as the region's strongman, its attempts to crush simple acts of Palestinian civil resistance and international solidarity demonstrate how weak and morally bankrupt it really is, argues Asa Winstanley. The second flotilla of activists intent on reaching Gaza by sea has so far been prevented from sailing by the Greek authorities. The Greek coast guard boarded two ships attempting to make a break for Gaza and forced them back to port. The reason given was unconvincing: they feared for the safety of passengers in light of what happened last year when Israel killed nine Turkish activists on the Mavi Marmara. So why, then, did they not instead pressure Israel to allow the ships to sail safely? In Britain last week, Raed Salah, a prominent leader of Palestinian popular resistance in Jerusalem was arrested by UK border police. Home Secretary Theresa May had apparently banned Salah from the country – although no one seemed to have been told about the ban before he flew into Heathrow airport, entering legally on his Israeli passport. Salah is an Israeli citizen, elected three times as the mayor of Um al-Fahm, one of the largest Palestinian towns in the 1948 territories. Salah is currently challenging the deportation order in the courts, and his lawyers have started libel actions against several British journalists who had accused him of anti-Semitism. These events do seem to demonstrate Israel has a degree of control over the policies of other countries. But I argue these are in fact symptoms of shared economic interests (or perhaps we could say desperation in the case of Greece), and common ideologies of racism and colonialism in the case of the US and Britain. Considering that Israel has for years tried and failed to find some way of silencing Salah, it would not surprise me if it turns out they had some hand in his arrest (Salah himself said from prison that Israel bore the responsibility). But a British political and media establishment which so often uses Muslims as scapegoats has its own reasons to generate irrational fear about Salah. Pro-Israel lobbyists like to talk about the “shared values” of Britain and Israel. They, of course, claim these are nice things like democracy and human rights. But in cases like the unjustified arrest of Raed Salah, we start to see the real shared values of Israel and Britain: in this case racism and Islamophobic scare-mongering. We also see the reality of shared interests and common methods when comparing Israeli and British wars (such as in Afghanistan). Israel and Britain use similar justifications when killing civilians: they were just “collateral damage”. Torturers in the respective armies were just a few “bad apples”. Fighters on the other side use “human shields” (an accusation which in the case of Israel is a matter of projection bias: Israel’s genuine use of Palestinians as human shields is well documented by human rights groups). With Greece, we should perhaps be more surprised. The country has a history of stormy relations with Israel. 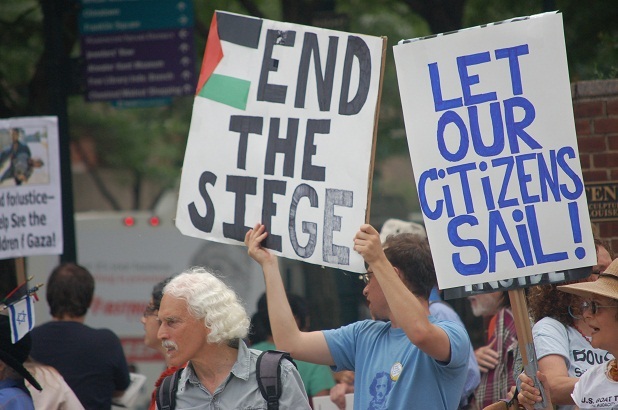 In 2009, Greece actually blocked an arms shipment during the Israeli onslaught against the Gaza Strip. But the recent financial meltdown seems to have changed things. There have been reports of increased Greek-Israeli ties, such as tourism links, a joint air force drill, a proposed natural gas pipeline project and even the sale of large amounts of riot gear to Greece. It seems the tear gas reserves are being depleted by Greek police attempting to put down the popular Greek protest movement against IMF austerity measures. For those who want to act in solidarity with Palestinian human rights, such ties can seem like formidable obstacles. But we should bear in mind that Israel is very much in the business of talking up and exaggerating its own power. It wants to re-build its myth of invincibility, so damaged by the 2000 and 2006 military defeats by volunteer resistance fighters in Lebanon. Now Israel is increasingly moving into the the arena of talking up its diplomatic power. In this context, having to lean on a state in as dire financial straits as Greece is perhaps more of a sign of weakness than anything else. The very first Free Gaza boats in 2008 were allowed through with very little publicity. By demonising simple solidarity actions like the flotillas to Gaza and the “Welcome to Palestine” fly-in to Tel Aviv airport yesterday, Israel is humiliating itself in front of the world. The act of attempting to deliver a cargo of letters to Gaza has led to a massive military, diplomatic and financial counter-operation – in a climate of near hysteria, with Israeli politicians talking as if they are in some sort of war. Speaking about the fly-in, one minister even invoked the 9/11 attacks: “We should… keep in mind what happened in the Twin Towers disaster”. A regime that resorts to such ridiculous, oxymoronic terms for its critics as “human rights militants” is very much on the wrong side of history.